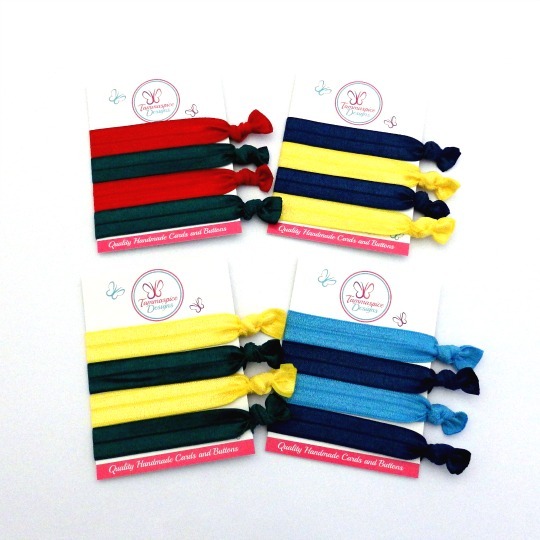 A pair of 23mm fabric covered button elastics – with thin snagless elastics, comes in a set with a pair of matching 23mm fabric covered button snap clips in your choice of school colour. Snap clip bases are 45mm long each. Also available with larger 28mm button elastics (see second picture), which is great for kids with thick hair or the older child. * See separate listing Mixed Set. *I put my 5yo in both sizes at the moment (and she has thin-medium hair) but as she gets older I’d get the bigger size set.